[Paul] likes a precise oscillator. His recent video shows a crystal oscillator with a “watch crystal” and a CMOS counter, the CD4060. Using such a circuit can produce very stable frequencies and since the 32.768 kHz crystal is a power of 2, you get nice divisions out of the counter. We’ve seen the same trick done with decade counters (like the 4518B) to divide by 10 instead of powers of two to make frequency standards. A 1 MHz crystal can easily generate 100 kHz, 10 kHz, etc. The Hackaday Prize is all about Building Hope. We want to see hardware creators change the world with microcontrollers and breadboards. That’s a noble goal, but it also doesn’t mean you can’t have fun. That’s exactly what [Yann] is doing with a pile of surplus Soviet components, a bunch of bodge wire, and exactly zero transistors. He’s building a hexadecimal display module using only relays and diodes. It’s absurd, but still very very cool. The inspiration for this build comes from homebrew computing. With this, there’s a recurring problem of displaying the status of a bus. Sure, a bank of LEDs will work, but then you have to count to F. The better solution to this is a hexadecimal display. The best solution to this problem is using Numitrons — seven segment Nixies, basically — and doing it all with relays and diode steering. This module accepts four bits as an input and uses a clever arrangement of diodes to turn those four signals into the digits 0-F. Yes, it’s hexadecimal, but that’s just what you do when you’re building your own computer. Right now, [Yann] has one module on a slim-profile protoboard that should stack easily enough for an 8 or even a 16-bit wide bus. That’s four tubes and hundreds of diodes for the 16-bit version, but the good news is all of these modules are identical, vastly simplifying the construction of the display panel of a homebrew computer. 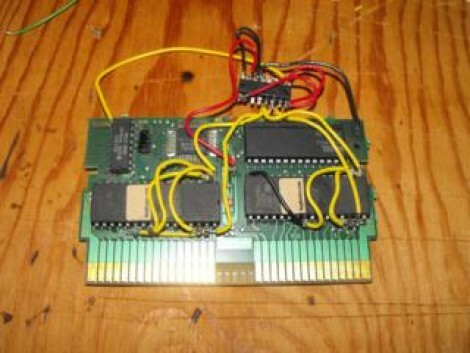 Here’s a mutlicartridge hack for the original NES that [Callan Brown] put together. He spent some time snooping around the signals on the circuit board seen above until he found the trace that maps the reset signal from the game console. This will be used to cycle through the various games stored on the cart’s memory chip. The ROM images that will be stored on this cartridge are concatenated, then burned to the EPROM. Since the donor cartridge (and the ROMs which were chosen) use memory managment, the hardware can be tricked into reading the ROM from a specific point in the EPROM. The switching itself is handled by a 74HC161 binary counter chip. The reset signal from the on-board security chip acts as a clock trigger for the counter. Some clever wiring allows the output of the counter to select the starting address for the EPROM. Each time you press the reset button it increments the counter, thereby selecting a different ROM to load. See [Callan] demonstrate the finished hack in the video after the break.